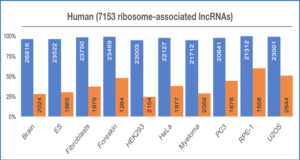 Long non-coding RNAs (lncRNAs) have been implicated in numerous physiological processes and diseases, most notably cancers. 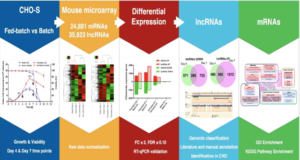 However, little is known about the mechanism of many functional lncRNAs. 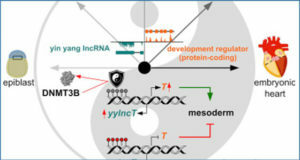 Researchers from the Dana-Farber Cancer Institute identified an abundantly expressed lncRNA associated with decreased melanoma patient survival. 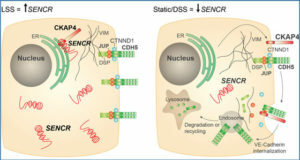 Increased expression of this lncRNA, SLNCR1, mediates melanoma invasion through a highly conserved sequence similar to that of the lncRNA SRA1. 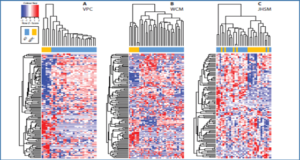 Using a sensitive technique they term RATA (RNA-associated transcription factor array), the researchers show that the brain-specific homeobox protein 3a (Brn3a) and the androgen receptor (AR) bind within and adjacent to SLNCR1’s conserved region, respectively. 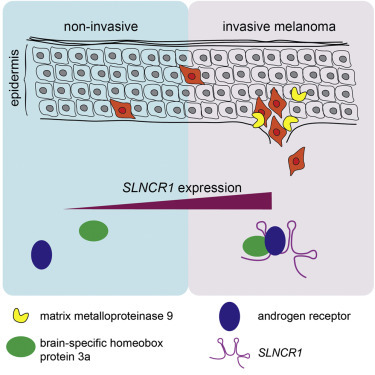 SLNCR1, AR, and Brn3a are specifically required for transcriptional activation of matrix metalloproteinase 9 (MMP9) and increased melanoma invasion. Their observations directly link AR to melanoma invasion, possibly explaining why males experience more melanoma metastases and have an overall lower survival in comparison to females. 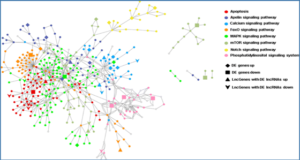 When SLNCR1 increases, AR and Brn3a bind to conserved, adjacent regions of SLNCR1. The SLNCR1/AR/Brn3a ternary complex has high affinity for adjacent Brn3a and AR binding sites located upstream of the MMP9 transcriptional start site. 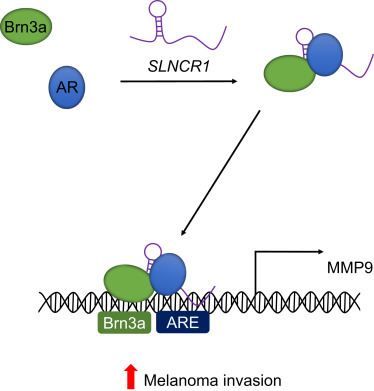 Cooperative binding of AR and Brn3a to its promoter increases MMP9 expression and activity and thus increases invasion of melanoma cells.